You’re in the home stretch of 2018. That probably means your team has started planning your social strategy for next year. But, there’s one problem: how do you keep everything organized? The best way to get started is with our 2019 social media content calendar template. 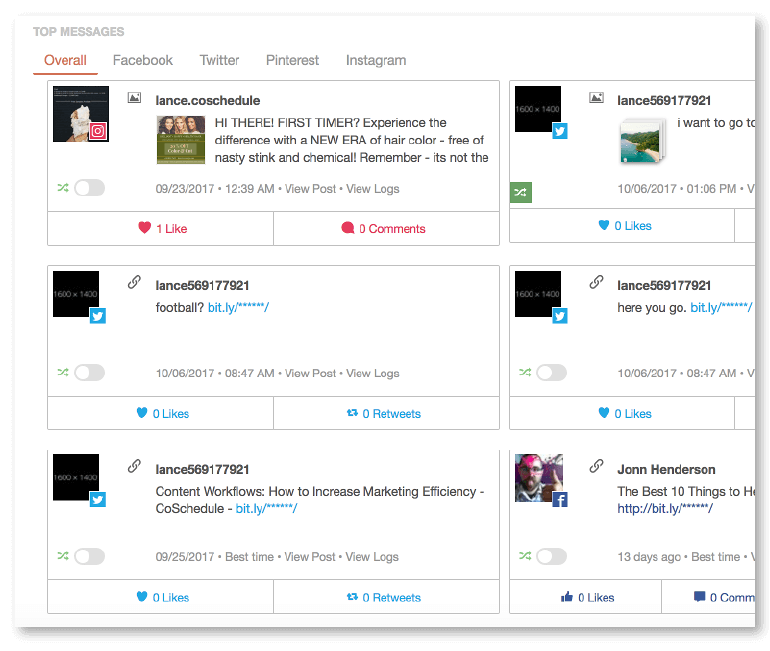 It’ll help your team plan all your posts for the entire year, all in one spot. 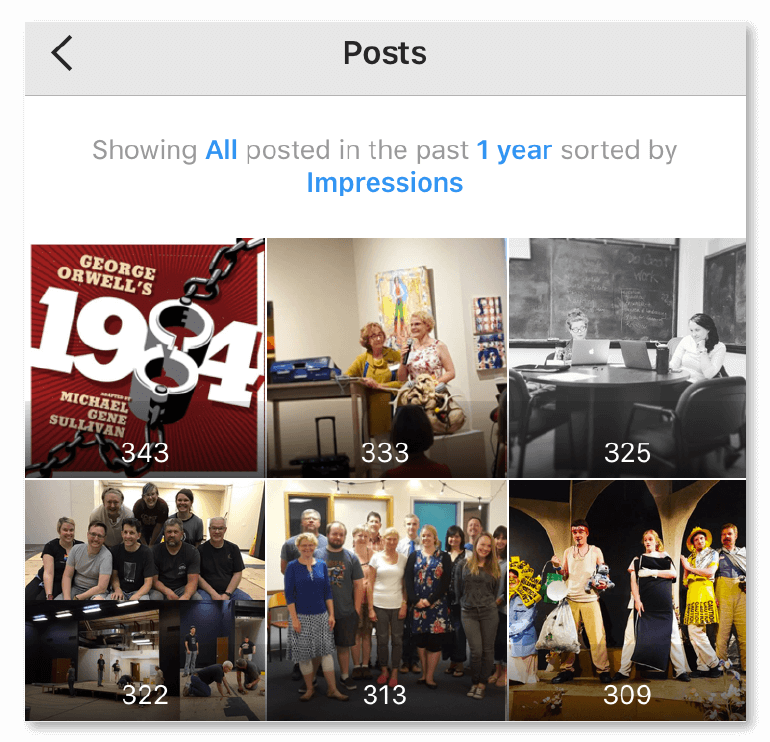 In this post, we’ll walk you through how to use it and keep your social media marketing organized all through 2019. 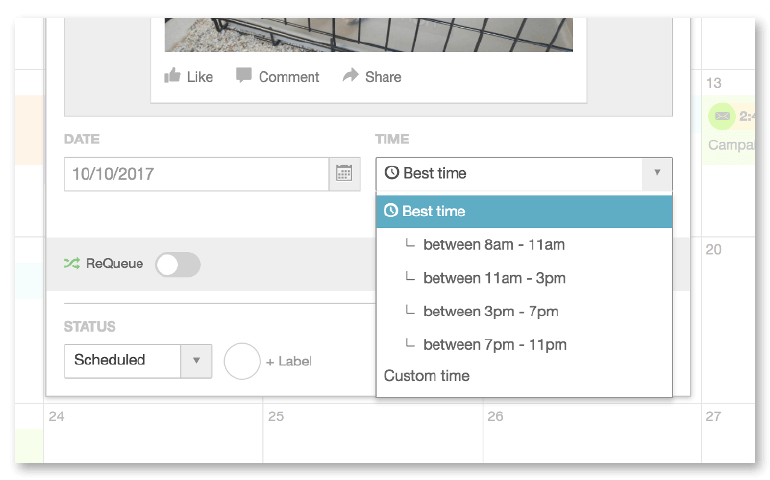 Then, we’ll even show off how to use CoSchedule as your all-in-one social media calendar app. Let’s dive in and make next year your most organized one yet. Keep all your social media marketing on track! With this easy-to-use calendar spreadsheet template, your entire social team can schedule posts, monitor deadlines, optimize your posting schedule, and more. 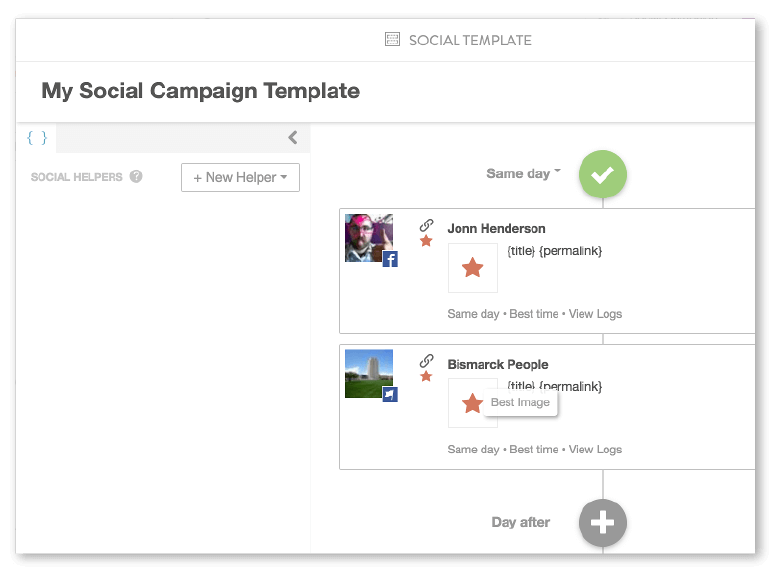 Social Media Campaign Template: Plan every campaign from start to finish with this template. 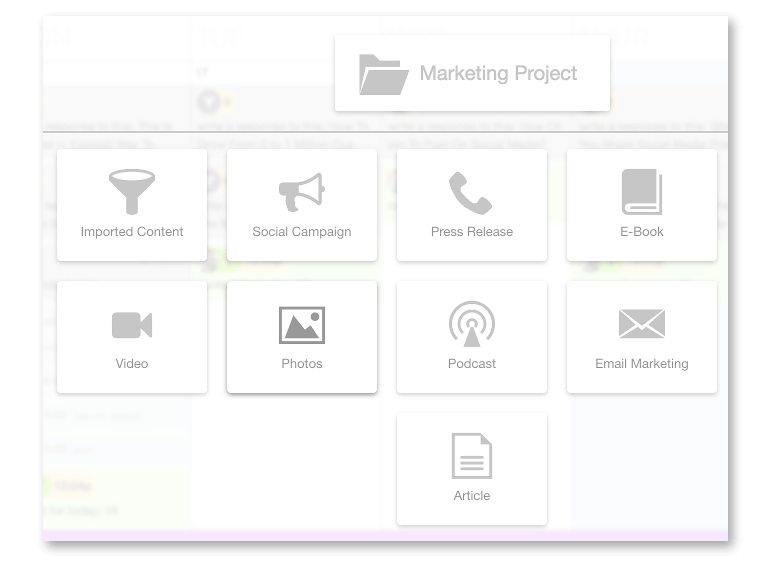 Social Media Strategy Template: Set goals, select channels, and more. Social Media Content Strategy Template: Figure out which types of content you’ll create to achieve your goals. Social Media Campaign Proposal Template: If you’re a consultant or work at an agency, use this template to land more social media clients. 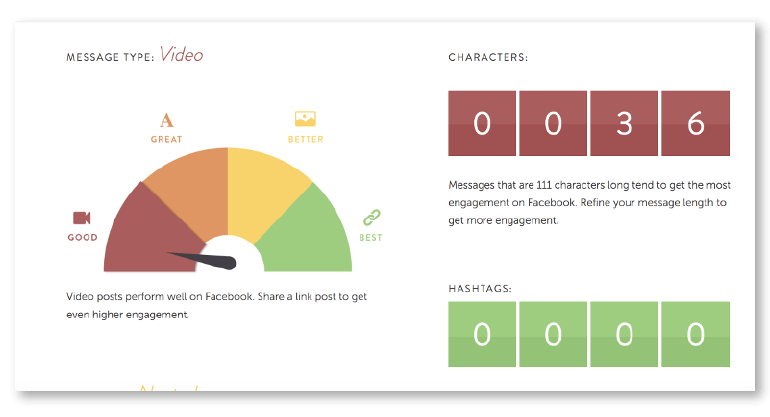 How Often to Post On Social Media Infographic: Use this visual reference guide to optimize your posting schedule and frequency. 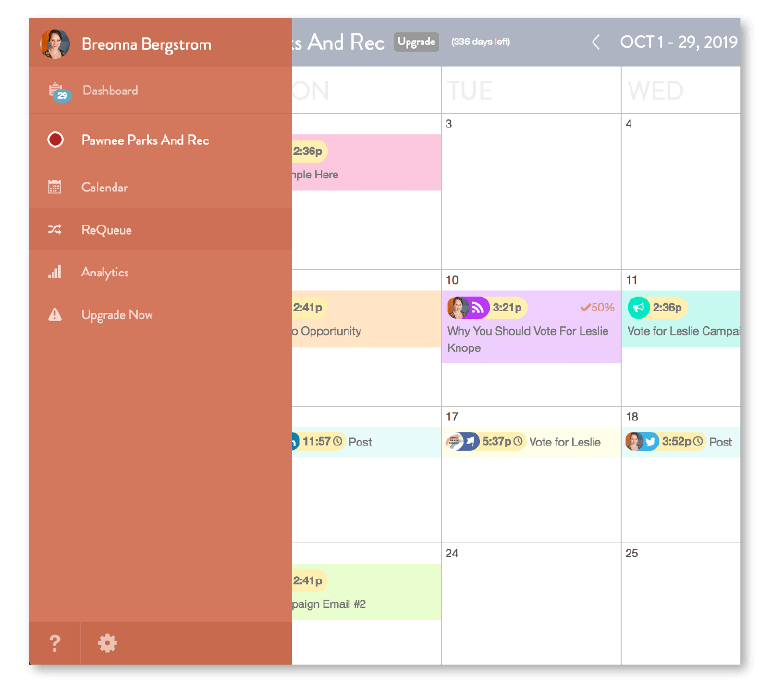 Get ‘em all free below, and then read on to learn how to use your new calendar. 2019 Social Media Content Calendar: How to Organize A Year of Posts the Easy Way. A social media marketing calendar can be anything you use to plan and execute your social media posts. They're typically built using either a spreadsheet or an app (like CoSchedule). We'll explain how to use the free spreadsheet-based calendar template included in this post. Then, we'll also show what you can do with CoSchedule. Why Do You Need A Social Media Content Calendar? As someone who has been working in social media marketing for the past five years, not having a social media calendar forces teams to operate in the dark. That inevitably leads to confusion, frustration, and a lack of focus. That's no way to effectively create consistent content on social media. 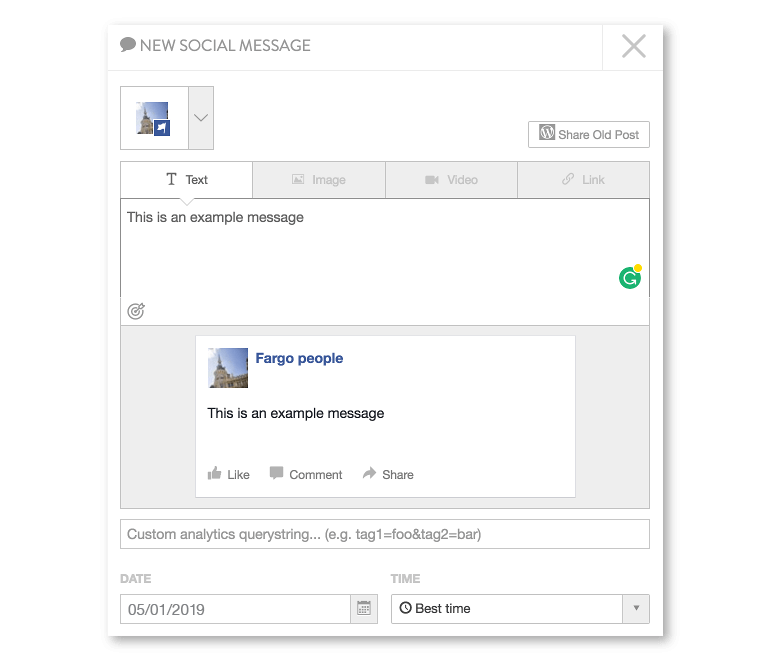 Social calendars give your team an overview of what content needs to be published, what’s coming next, and the strategy behind why content is being published at a certain date and time. They also help you keep up a consistent posting schedule because you never have to scramble and figure out what to post next. When your marketing team has several different things going on at one time, knowing your social posts are lined up and ready to go frees up time and mental energy for other tasks. In short? Save your sanity and use a calendar. 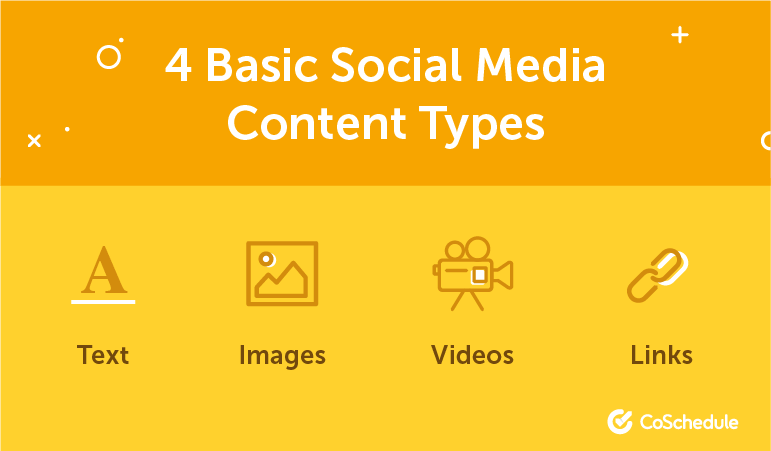 Before you begin to fill out the social media calendar template you just downloaded, you need to determine what channels and content types you’re going to be using. First, list out the social media channels that your organization is currently active on. Second, evaluate the effectiveness of those channels. Where is your audience? If your target audience is more active on one platform over another, that active platform is where you need to be focusing your efforts. What platform has experienced the most growth in the last year? If you see tremendous growth on a platform, look through your analytics to find out why. Is it a certain content type that’s attracting audience attention? Or, maybe a specific campaign boosted your growth? Where is your traffic and engagement coming from? Is there an individual social channel that seems to be engaging your audience and driving more traffic to your website? What is your team doing on that channel differently than others that are potentially causing that difference? At the end of the day, your team needs to follow the lead of your audience. 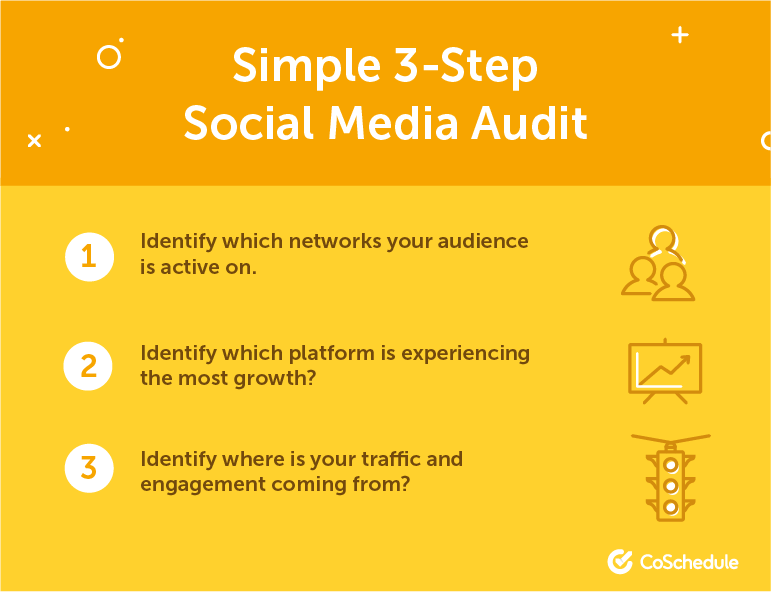 The last part of your social media audit should include deciding which types of posts you’ll be sharing across each of your channels. Images. This could include single images or gallery posts. Videos. This could include live video streaming (ex: Facebook Live) or natively uploaded video content. Text. Sometimes catchy copy is all you need. Links. Links to external content (owned or curated) would fall under this category. Depending on your team’s capabilities and which networks you’re on, some of these content types might be more important to you than others. 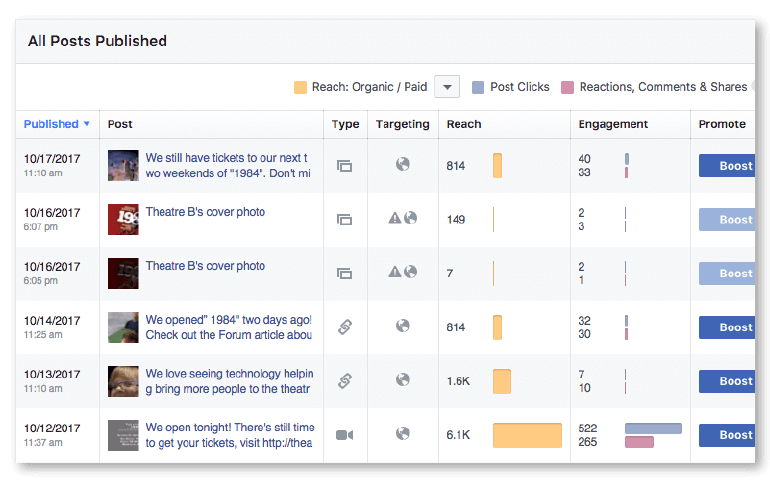 If you’re already posting consistently across different social channels, use in-app analytics for each channel to look for spikes in engagement and traffic. What types of post content are causing those spikes? 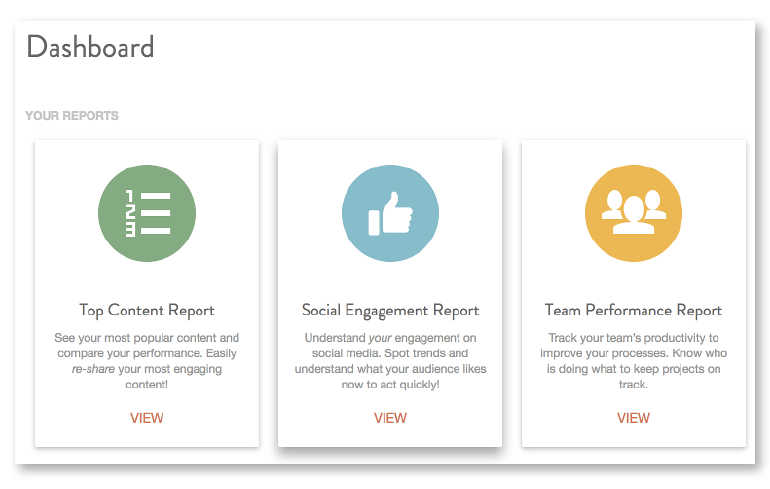 If you want an easy way to access your social message analytics, use CoSchedule’s Social Engagement Report. Next, let’s look at how to use your new social media calendar. The calendar is broken out with networks listed on the left. Then, there are fields for Content, Image Link, and Time for each post. 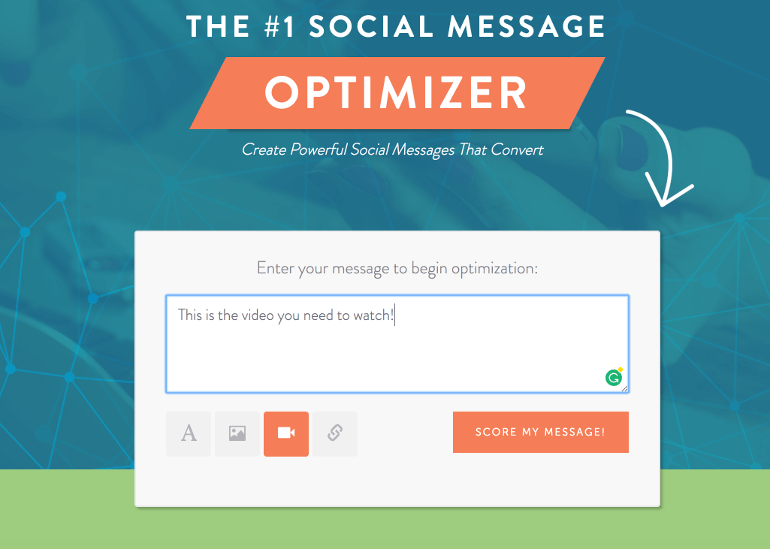 If you want to really pack a punch with your social media messages optimize them for each network to encourage your audience to interact with them by using our Social Message Optimizer. 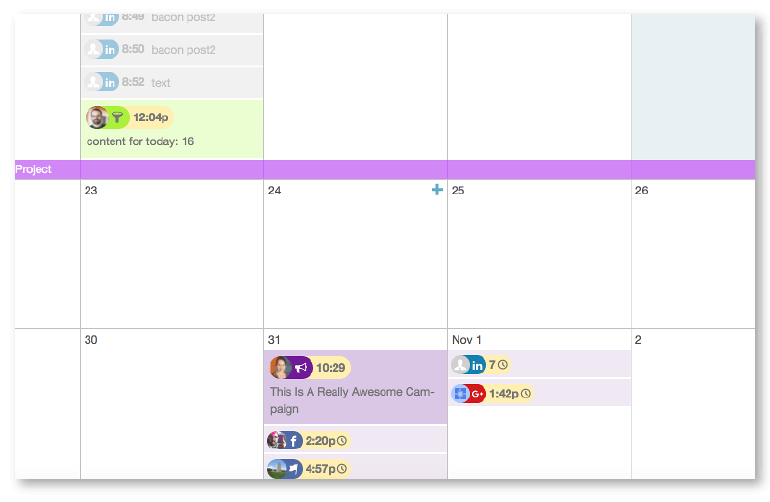 Once you have a message where you want it to be you can copy it into your calendar. The next step is to include any visual content and links each post will need. 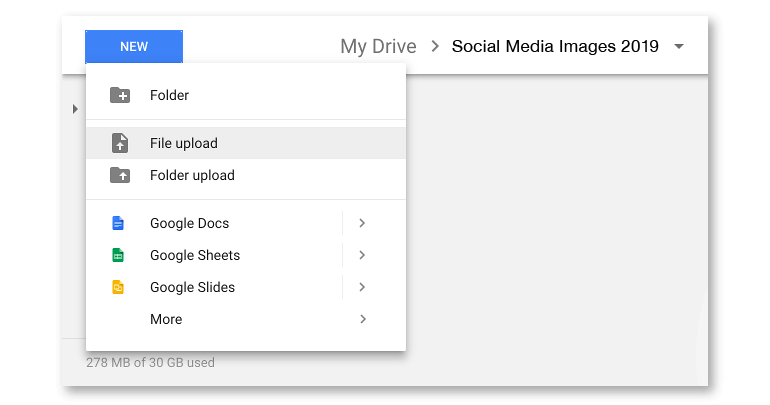 The easiest way to do this is to upload your videos and images into a cloud storage system (like Google Drive or Dropbox) and copy and paste the link into your calendar, so your social team can easily access it. The last step in filling out your calendar is including a time that you want your post to publish. To maximize the number of people that see your posts, you’ll need to send them at the best time. After that your social content is ready to go. Coming up with a year’s worth of content can seem a bit intimidating, but there are recurring events that you can add to your calendar to help fill it. Holidays: Use National Day Calendar to find ones you might not have even heard about. Events: These can be company, local, or national events. Sales: If you have recurring sales like a Black Friday or Cyber Monday sale you can use them to fill your social calendar. Product or feature launches: If your team is launching new products or a new feature that accompanies your project build that momentum with a social media campaign. 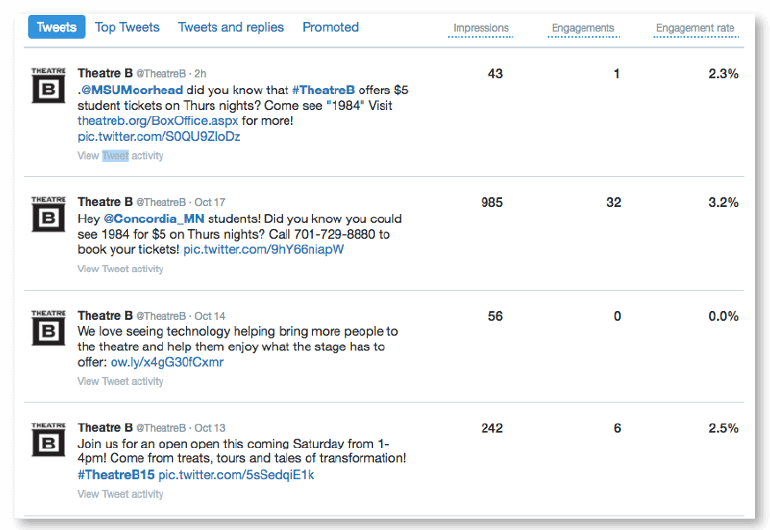 Themes: Create your social content around different topics that relate to your organization. 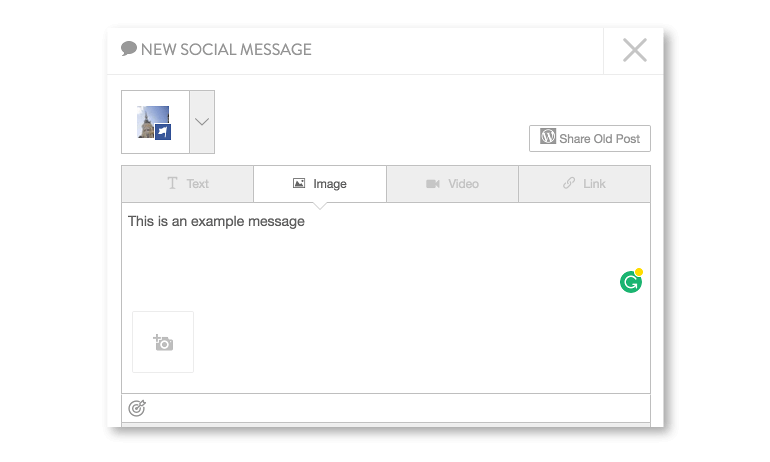 This saves your team from posting about the same things over and over again. That can add up to a lot of things to keep track of, fast! There is a trick to keep track of your content: color coding. In your template, you’ll notice a color key at the end of every month. This way your team can keep track of what events are coming up when. It also makes transitioning them over to a new calendar each year much simpler. Your social media posts will get little traction unless you optimize the times they post to the network. Now maybe you team can’t post that frequently. 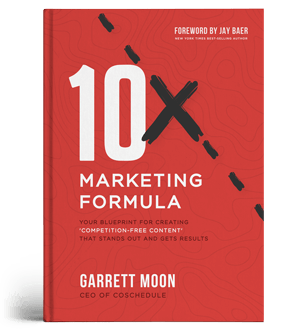 Start with publishing at a frequency your team can handle and work your way up to a more robust schedule. 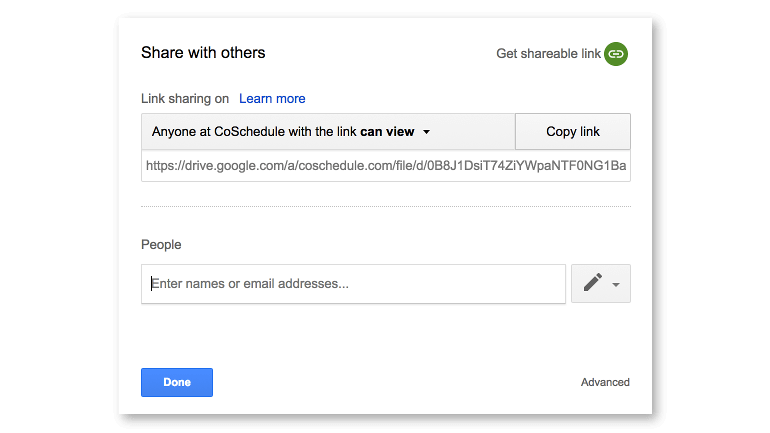 Once your team gets into a rhythm you’ll be able to publish more content faster and faster. 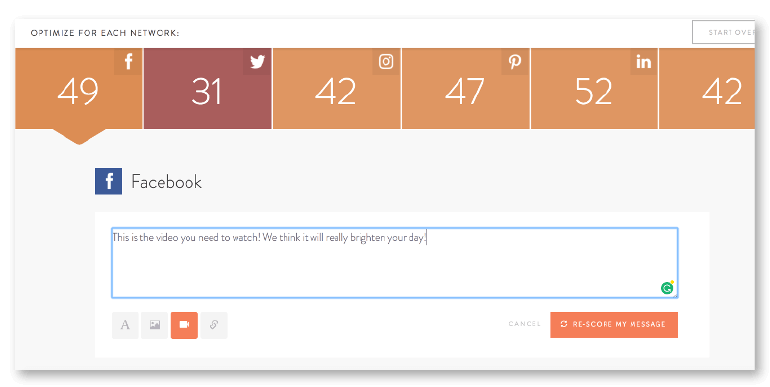 If you really wanna step up your posting game, let CoSchedule help you out with Social Templates. 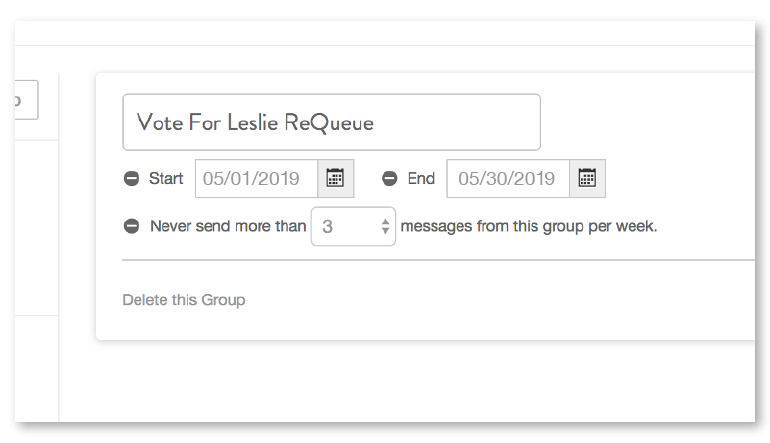 Social Templates are part of an automation feature that lets your team create different publishing schedules and attach them to campaigns, content and more. Once you have your schedule established you need to optimize the time they publish to reach the maximum number of eyeballs. 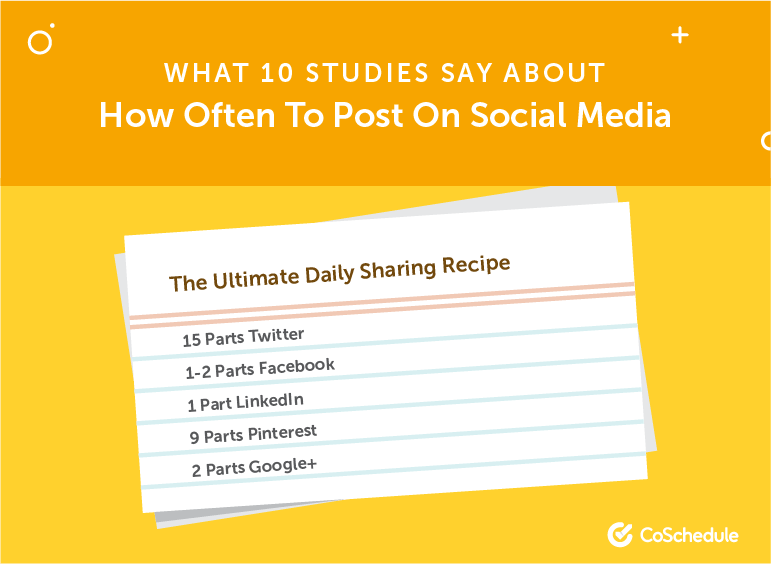 What 20 Studies Say About the Best Times to Post on Social Media? You can continue to use the infographic and manually schedule your posts. 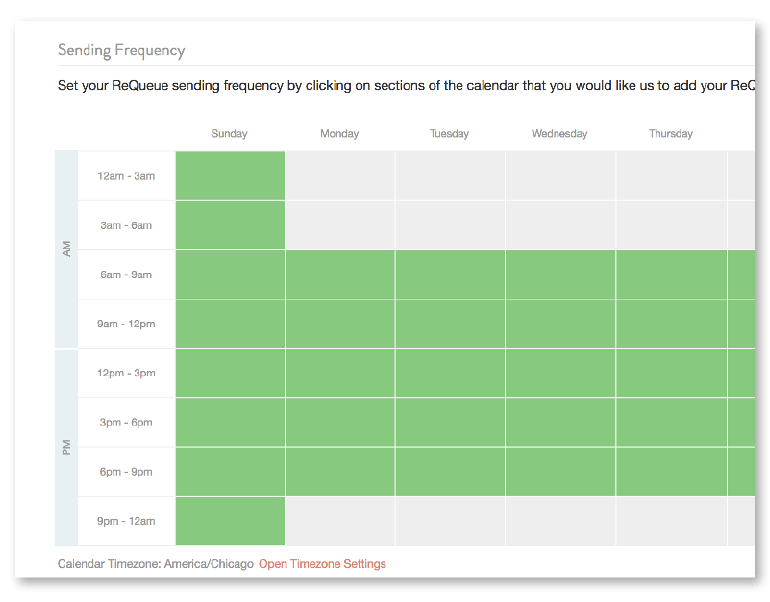 Or, if you’re a CoSchedule customer, you can automate your posting schedule with Best Time Scheduling. 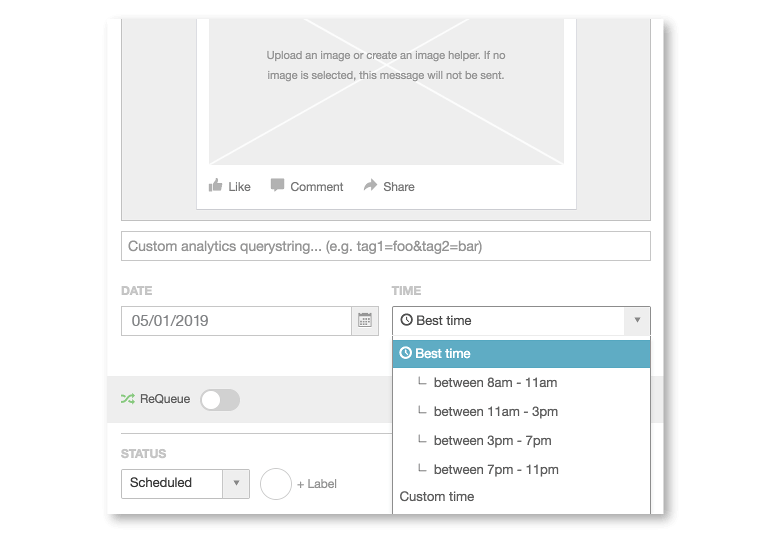 Best Time Scheduling automatically publishes your posts at the best time for your audience and using the feature is as easy as clicking a button. Let’s say you schedule a post that does really well with your audience. Wouldn’t you want to use it again? That’s where ReQueue comes in. 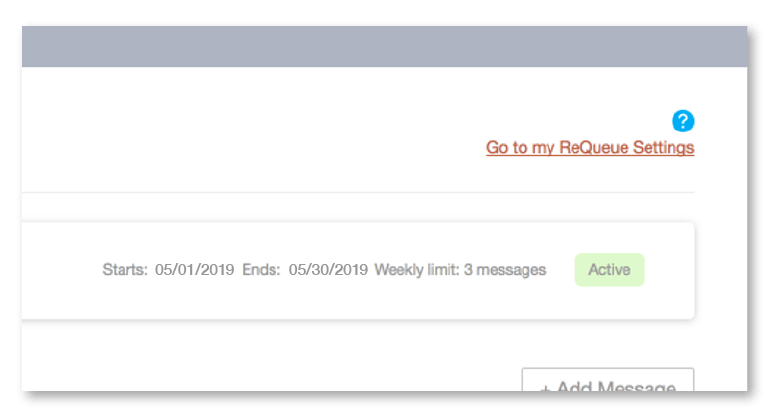 ReQueue is the most intelligent evergreen content tool on the market, and all it takes is a few clicks to republish your best content over and over again. 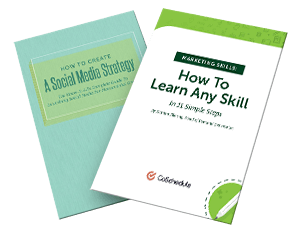 Ready to Upgrade Your Social Media Calendar? 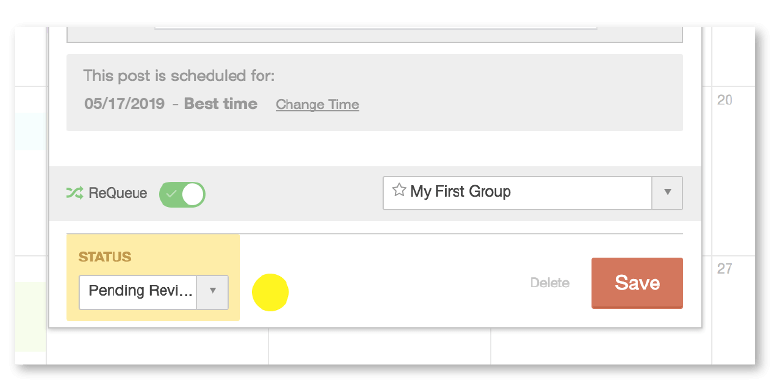 Try CoSchedule Free for 14 Days. 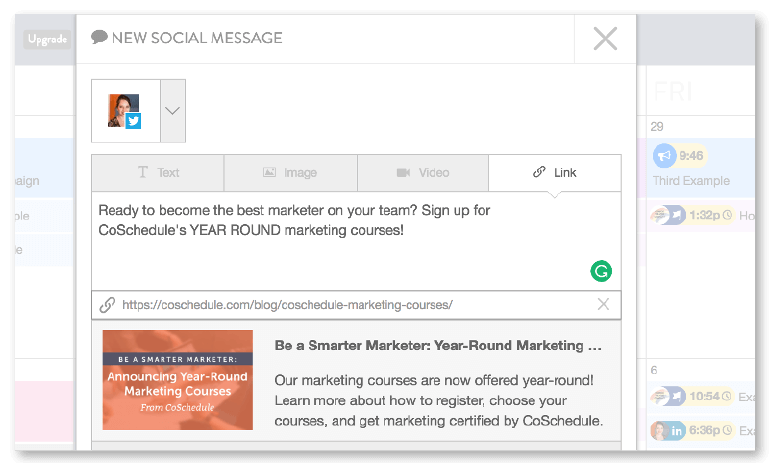 Your team will get adjusted and start powering through your social media messages in no time. But, what happens when your team outgrows your spreadsheet and wants to better content in less time? 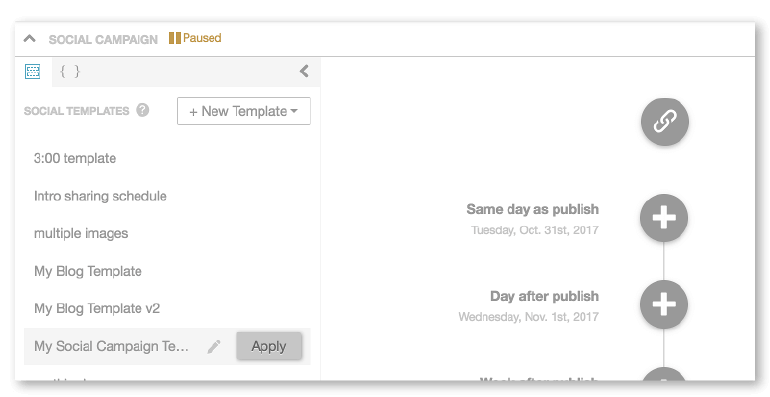 Our editorial calendar will help you your team, create and publish content faster and easier than you ever did before. This post was most recently updated on Dec. 20, 2018.